It’s Speedy Tuesday! The moment you’ve all been waiting for. This week’s Speedy Tuesday is about the Speedmaster Professional Racing models, both old & new. 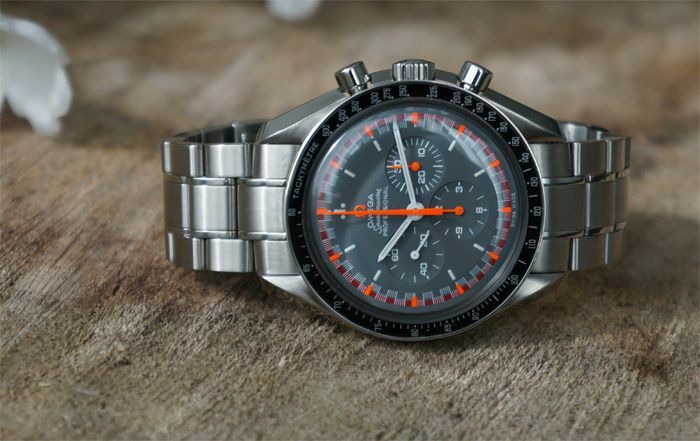 You probably know the re-edition that OMEGA did in 2004, the reference 3570.40.00 Speedmaster Professional. Last week, we received photos from one of our readers’ (Martijn Hofman) Speedmaster Pro 3570.50 that was converted to this Racing edition by his watchmaker. The reference 3570.30 model was for the Japanese market, but apparently the dial and hands are still available as spare parts. More about customization? Check Shane’s Speedmaster Paramedic here. As you can see, the orange chronograph hands, hour markers and logo really stand out. The racing pattern on the dial is in red and white. Now, this configuration was not all new when it appeared in 2004. We’ve seen similar dials on the Speedmaster Professional Mark II and on the vintage Speedmaster Professional ref. 145.012. 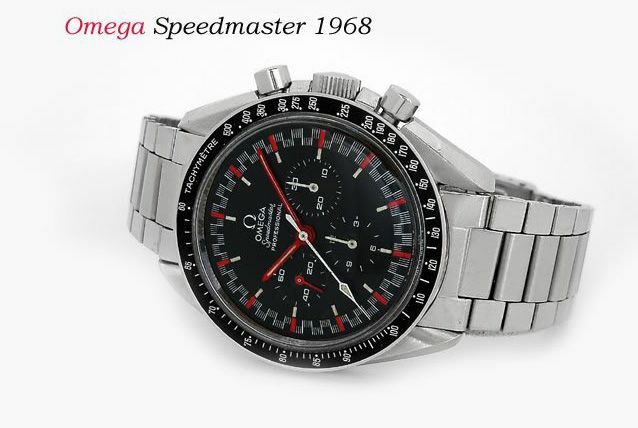 In the “Time Capsule” book, we’ve seen a photograph of this OMEGA Speedmaster Pro 145.012 with a racing dial. The photo in that book was taken by editor and collector Imran Khan. Imran sent me a photo of that same watch a few months ago, clearly showing the same dial pattern as on the modern Racing models. However, on this watch, all hands are red except for the chronograph hands. So they inverted them. Only 2 days left before Baselworld 2013 and some of the news already leaked through the consumers, such as the new Speedmaster 9300 models “Dark Side of the Moon” and the Speedmaster caliber 9300 ’57 edition. One of the novelties that is already on the OMEGA website, is the Speedmaster Professional ‘Racing’, reference 311.30.42.30.01.004. 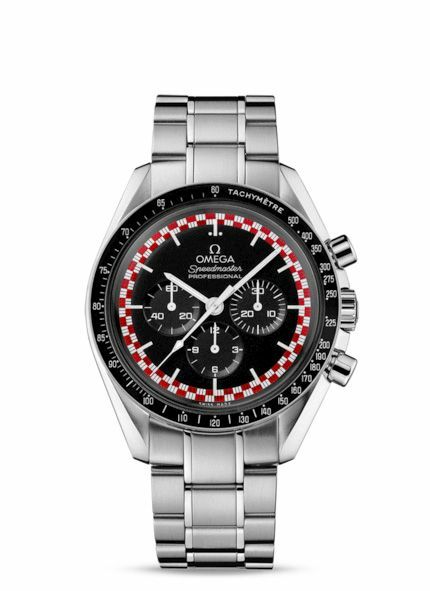 A ‘regular’ Speedmaster Professional based on the 3570.50, but with the ‘checkered’ dial and red engraving on the caseback. It concerns the normal “Flight-Qualified by NASA for all Manned Space Missions’ and “First Watch Worn on the Moon” engravings, not referring to any racing. So, why the ‘racing’ you might ask? Well, in the late 1950s, when there was no link yet with NASA’s race for the Moon, the Speedmaster was meant to be a watch for sports purposes like car racing. That’s why it has a tachymeter (a tachymeter doesn’t make sense with regards to Saturn V rockets or Space Shuttles) in the first place. An easy to use, very legible chronograph. 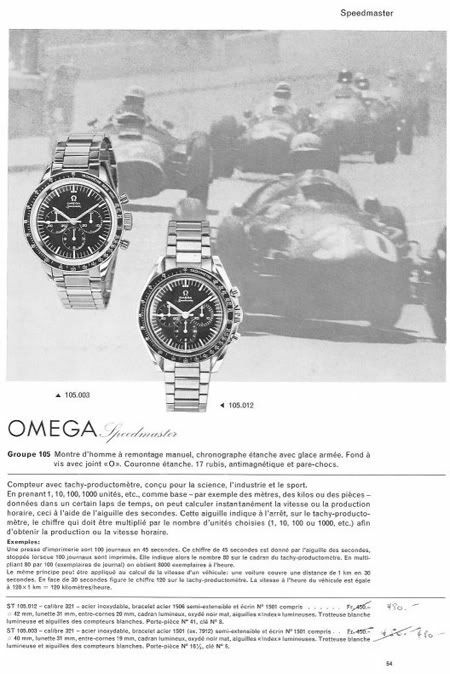 As you can see below, even the later Speedmaster references like the 105.003 and 105.012 (basically the same as the 145.012) have been used for racing-related advertisements. We will definitely ask the OMEGA representatives in Basel why they decide to relaunch a Speedmaster Professional Racing to get a bit more of background. Make sure to follow us during Baselworld (we are there on the 25th of April to the 2nd of May) on this blog, our @fratellowatches instagram account and our Facebook page.